with notes provided by Prof. Dennis Power. Dracula's older brother Prince Mircea is born. begin to refer to him as Vlad the Dragon, or Vlad Dracul. Later that year, Vlad Dracula (Son of the Dragon) is born. burned to death for revealing to Vlad that she was indeed his true mother. of a rival clan to Mircea Tepes I, fathered by his brother, Dan Tepes. Dracula's younger brother Radu the Handsome is born. 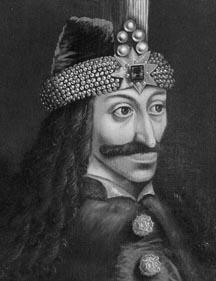 Vlad Dracula becomes Voivode (Prince) of Wallachia. one day become his bride. Mircea rules Wallachia in his father's absence. Dracul is released, but his sons remain hostages. and buried alive, and Vlad is killed attempting to escape his capital city. Wallachia as the Sultan's minion. Dracula spends several years living in Moldavia. invaluable, but Hunyadi dies of illness during the campaign. August 22, Dracula is again Prince of Wallachia. young gypsy woman of his dreams. that carried Vlad Dracul, Mircea, and Mircea's wife to Scholomance. this demonic strain of vampire-like beings. beliefs, particularly the sacrifice and resurrection of Christ. whom he too believed to be Satan. Special thanks to my colleague Prof.
Jay Lindsey for bringing the F. Paul Wilson reports to my attention. Vlad Dracula means "Son of the Dragon"; it also means "Son of the Devil." or villages suspected of disloyalty. blood of his victims, believing it would give him vitality. another rival for power named Dan III, and personally beheads him. Dracula wins an impressive string of victories over the Turks. army three times the size of Dracula's. Dracula fights a defensive war using scorched earth and guerrilla tactics. having failed to capture Wallachia. disease, he will become a vampire. valley had been formed upon the Devil's (Rasalom's) arrival on Earth. receive occult training and mental preparations prior to becoming vampires. Once they become a vampire they have vast powers." 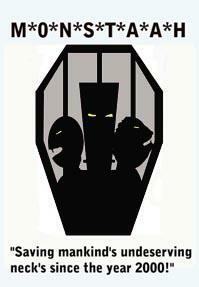 on the malevolent creatures known as Vampires click here. She-Demon" in Giant-Size Dracula #1, published by Marvels Comics. river and have all laborers and other witnesses to this act impaled. or not this was speaking of a battle alongside or against Rasalom, Prof.
Foundation have been unable to find any new clues in this matter. centuries later, after he had become the Lord of Vampires. and sent on a trans-temporal mission back to the 5th century A.D.
this plan have not been uncovered to date, however. Dracula lays siege to many areas of the desert regions of Scandinavia. to destroy him before he could do the same to them and their land. the X-Men: Apocalypse vs. Dracula TPB, published by Marvels Comics. format in six issues by DC Comics in 1975-76 (A.D.). (such as Beowulf's alleged journey to Atlantis). undoubtedly plays a factor in the conflicting accounts, too). comic book format in Beowulf, Dragon Slayer # 4 by DC Comics.